It’s an all-too brisk thirty-five degrees here in Charlotte, North Carolina as I write this post…a perfect temperature and time of the year for a cult-tv theme watch about snowmen and Yeti. A Yeti, in particular is a legendary ape-like creature of substantial height, believed by some to exist in the Himalayas. So Yetis -- or “abominable snowmen” as they are sometimes known -- are essentially snow-bound versions of Big Foot (or Sasquatch). Yeti and abominable snowmen have made quite an impact on cult television history. Perhaps the most famous example comes from the era of the second Doctor (Patrick Troughton) on Doctor Who (1963 – 1989). At this juncture in the series long-history, the producers were searching for new villains to match the popularity of Terry Nation’s Daleks. 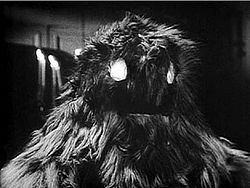 They came up with furry yeti robots controlled by a malevolent entity known as “The Great Intelligence.” The yeti appeared in the serials titled “The Abominable Snowman” (1967), “The Web of Fear” (1968) and later in The Five Doctors (1983). In 2012, the Great Intelligence returned to Doctor Who and commanded a different brand of deadly snow man. 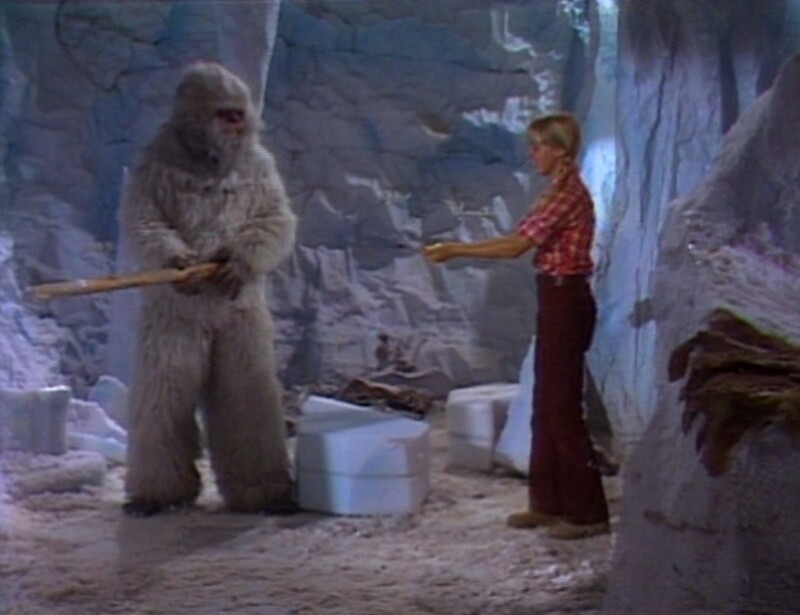 The Sid and Marty Krofft live-action Saturday morning series Land of the Lost also featured the Abominable Snowman in two third season installments. In “The Abominable Snowman,” a unicorn wandered into the Altrusian valley, and a Snowman, considering it prey, followed. In a follow-up episode “Ancient Guardian,” the yeti returned one more time. 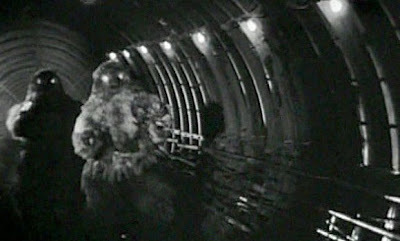 In both instances, the Yeti was depicted in a very unconvincing, puffy fur costume. The Yeti (or Yeti-like creatures) have also been seen as villains on animated series such as Johnny Quest, Ben 10 and Scooby Doo, but on the current The Regular Show, a yeti named Skips is one of the good guys. An attacking abominable snowman was also the main antagonist in the 1977 TV movie Snowbeast starring Bo Svenson, Yvette Mimieux and Clint Walker. In this tale, a murderous big-foot type creature wandered into the vicinity of the Rill Ski Lodge, and began killing skiers. This amusing horror made-for-TV film is brimming with menacing first person subjective shots and at each commercial break, the film fades to blood red for macabre effect. Every now and then, a furry arm or gnarled paw breaks into the frame to enliven the proceedings and there’s a great monster attack set in a barn. 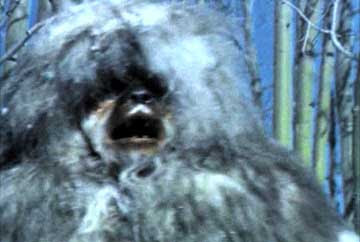 I especially like that this TV-movie repeatedly makes the point that most Big Foot creatures are reputedly peaceful (as does Land of the Lost’s “Abominable Snowman” installment…), yet this Yeti is entirely malevolent. It decapitates victims on a whim and stores the corpses in a barn for the long cold winter. John, I enjoyed the Yeti and snowmen retrospective. But what was number 8 and 10 from? #8 was from a made-for-tv movie in 1977 called Snowbeast (starring Yvette Mimieux), and #10 was from Ben 10! You're focusing on TV yeti, of course, but the subject line immediately made me think of the yeti in the The Mummy: Tomb of the Dragon Emperor, which served as guardians and could be very deadly, but weren't by nature evil or malevolent.